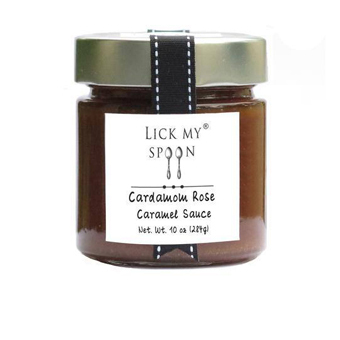 Kristine Insalaco-Gaioni, creator of the ethereal line of caramel sauces bearing the Lick My Spoon label, has given your next bowl of ice cream a Middle Eastern twist with the latest flavor in this award-winning roster - Cardamom Rose. Handcrafted in small batches to ensure a silky smooth, pourable sauce, it starts with Kristine's triple award-winning caramel sauce as its base. The addition of spicy cardamom and organic rosewater lend an exotic twist to fresh fruit, yogurt, pancakes, waffles, cakes and ice cream.